DONETSK, Ukraine -- The Russian military leader of pro-Russian rebels in the eastern Ukrainian city of Donetsk, Igor Girkin - known as Strelkov - has resigned. 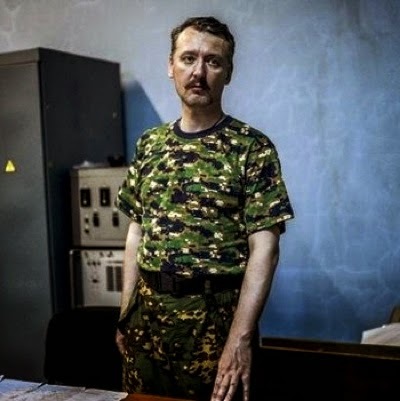 Rebel sources denied reports that Russian Commander Strelkov had been injured. Alexander Borodai, the former PM of the self-declared Donetsk People's Republic, confirmed the news but denied reports Strelkov had been wounded. There has been heavy shelling both in Donetsk and Luhansk as Ukrainian forces battle the separatists. The news came with a disputed Russian aid convoy stationed near the border. Borodai confirmed Strelkov's departure to Russian media but gave no reason. He said reports that Strelkov, a Russian citizen, had been injured were "total rubbish". "You probably already know that he, like myself, has left his post," Borodai said in a video posted by Russia's pro-Kremlin Life News website. "The [Donetsk People's Republic] already has a new defence minister." Borodai said the new minister went by the nom de guerre Tsar. His name was given by other sources as Vladimir Kononov. There have been two other high-profile resignations of rebel leaders in the past week. Borodai handed over to Alexander Zakharchenko as "prime minister" in Donetsk and the rebel chief in Luhansk, Valery Bolotov, said he was temporarily handing over to his defence minister, Igor Plotnitskiy. The Russian aid convoy of at least 260 lorries, which moved towards the border on Thursday, has now halted. The BBC's Steven Rosenberg travelled alongside the convoy. We followed the convoy for about nine hours, having left Voronezh before dawn. The convoy turned off the main highway - the M04 - on to a smaller road to the border. All the lorries are now parked here in a field. We asked one commander to show us the contents of the lorries. He selected one, and it contained sleeping bags. But it was just one of at least 260 lorries. I cannot say accurately what the contents of the others are. The lorries will wait here until the convoy is given orders - but there is no indication when that will be. I spoke to one driver. He was very anti-American and asked why the United States was trying to take Ukraine away from Russia. The key question now is what Russia does next. If it takes the convoy across the border, it will be seen by the Ukrainian authorities as a major provocation. Russia has dismissed as absurd claims that its convoy is a pretext to send military supplies to the rebels. But Ukraine has said the Russian convoy must be inspected by international monitors before it can be let in. Colonel Andriy Lysenko, a spokesman for Ukraine's National Security and Defence Council, said that if this did not happen, "movement of the convoy will be blocked with all the forces available". Artillery fire could be heard all around Donetsk on Thursday, with the authorities urging people to stay off the streets. Two shopping centres were reportedly hit and at least one person killed. The situation was reported to be desperate in Luhansk, where civilians have been short of water, food and electricity for more than a week. Phone lines are also down as shelling continues. Ukrainian authorities say they have cut off Luhansk from other rebel-held areas after capturing the town of Novosvitlivka. Some 2,086 people have been killed since the conflict in the east began in mid-April, more than half of them in the past two weeks, the UN says. The violence began when pro-Russian rebels seized government buildings and tried to declare independence. The military launched an operation to retake the east, and stepped up its activities in June. Meanwhile, Russian President Vladimir Putin has been visiting Crimea, which Russia annexed from Ukraine in March, in a move that drew international condemnation. He struck a conciliatory tone in his speech, saying: "We must calmly, with dignity and effectively, build up our country, not fence it off from the outside world." He added: "We do not intend, like some people, to dash around the world with a razor blade and wave that blade around. But everyone should understand that we also have such things in our arsenal." Some crazy idea: After humanitarian assistance from 260 some trucks is delivered perhaps they can be used to take out of Ukraine disarmed pro-Russian separatist. It is wild but, who knows if such compromise is possible. Am sure many who committed crimes could of escape but, it may be better to let them go then letting them to keep killing Ukrainian soldiers.